As I promised you in my previous post about my brand new relationship with Julia Janus brand, today I'm super excited to present you my very first outfit for our lovely collaboration! I'm pretty sure that those who are already aware of Julia's Janus clothes, would say that it's very feminine and not very suitable for young fashionistas. However, I would like to deny that as this collaboration is a perfect way to show you guys how versatile these garments are! From my experience, it's very common that we are usually too lazy to try on clothes if they don't look attractive from the first sight. We just leave them to hang there in the store without even touching it. Well, I thought the same as well till I tried some Not Really My Type items and they looked completely different on my body!My advice would be, never be scared of trying! Even if it doesn't seem your type, you never know. You'll see the next outfit soon on the blog as I've picked two of them from Julia Janus store. For now, I'm very happy to present you the first one and I think it's just ideal for these cool and windy/rainy autumn days. I don't know how about you, but grey colour for a knitwear seems something perfect for me. Especially if it's so soft and cozy! If you have a chance, I definitely recommend you to try on this beauty in JJ stores. Also, I matched black classic trousers with a very unique cut at the bottoms! I really believe that you could wear this outfit for a cozy evening with friends, busy day at the office or even some fancy event at the city! Eiii, pasakiskai! Ir fotkes nuostabios! Aciuuu:* As irgi kuo toliau, tuo labiau bandau matuotis kazka, ko siaip niekada nesideciau. Galim sau leist ir paeksperimentuot! Labai grazus derinukas ir nuotraukos nerealios! oi, labai gražu! ir batukų spalva skani.. I love your outfit and the gray building and stairs match it fabulously. 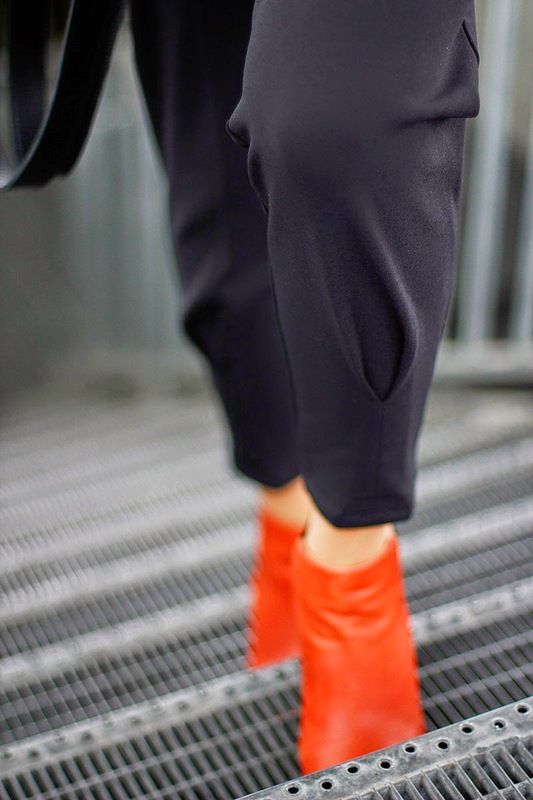 Great red booties.